Not really all that much has changed. One area has grown, there was some new glass... I've had this sitting on my computer for a while, and i've forgotten what exactly I changed. Anyway, this is probably the final release of the map, i'll be making a new one someday soon though hopefully. I goofed up uploading the map, so almost none of the clipping was done and there were missing textures. Sorry about that! This new version should fix these things. Just overwrite all the old files, although the only thing that's changed is the ogz itself. This is my first map for Tesseract, and I think it's a decent first try. 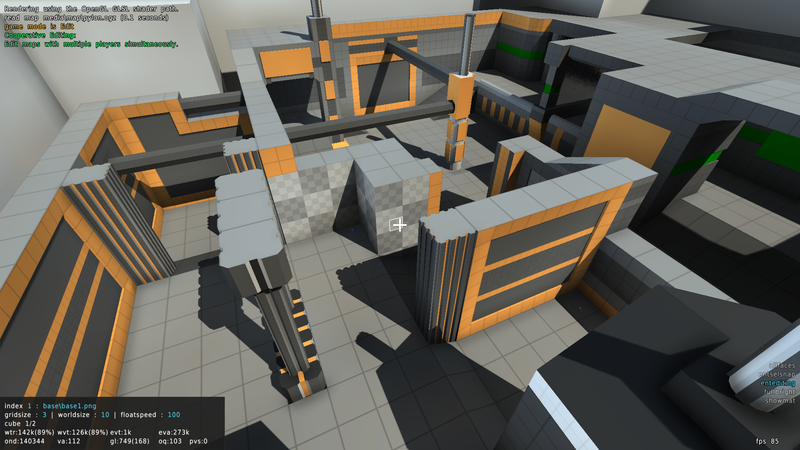 It's a small-ish map intended for pure instagib play, rather than CTF. Visually simple, I know, but the lack of texturing options in Tesseract at the moment have limited what I can do, so I decided to take the "solid colours" route and try and make a map from this. I tried to make up for this lack of texture detail with actual map detail, but i'm not entirely sure if it's worked out either. Feedback about that would be appreciated, as well as feedback covering the feel of the map in general. The layout is pretty much finalized, as making significant changes at this point would change the map too much, but smaller details l am still open to investigating. and here is the map itself! All feedback will be appreciated! The map looks good but could have some more point lights. Use /hidehud 1 to hide the HUD while doing screenshots; it's also suggested you use maximum graphic settings (including anti-aliasing) when you do so. /hidehud 0 shows the HUD again. It looks good, you don't need that many assets to make a nice looking map. I'll try it out. Texture seems to be missing from one wall, by the way, though that might possibly be my config's fault. It's a great map, would like to play on official servers. I'm also missing that texture. Apart from that, good work! Someone should put this on a server. Can someone send me a screenshot of the missing textures? Also, hosting this map on a server isn't really that viable because sendmap can't distribute the additional textures I used. I have your textures in the right place, the map cfg file seems to be referencing them correctly, I just assume the map's ogz is referencing a different texture index (if your default_map_cfg had changed, or ours) would affect that. New update has been posted!